How Can Students Learn Better Time Management Skills? It takes me three minutes to fill my car with gas. I can empty the dishwasher in six. Mowing the lawn, on the other hand, takes an hour and ten minutes. Each of these facts may seem overly specific and insignificant, but knowing exactly how long these tasks, and others like them, will take helps me plan and manage my time. This leads to well-planned, low-stress days and optimal emotional regulation. 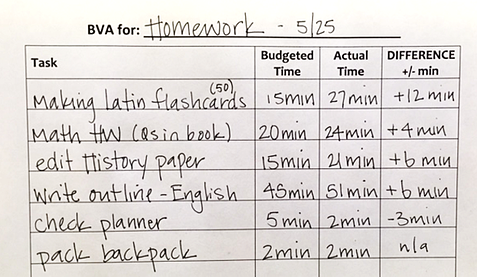 As an Executive Function coach, I teach students to budget their time in the same way. Better yet, my coach colleagues and I know that time management tools like these can stick with our students well beyond their academic lives. One of the most effective tools that we Executive Function coaches use for time management and planning is called Budget Versus Actual, or BVA. Understanding the time you have budgeted (B) for a task, versus (V) the time the task actually (A) takes, you can start to have a better understanding of how long everyday tasks should be scheduled for. This is essential for our students when creating their homework plans for the evening. Does it really only take 15 minutes to make 50 flashcards? Is writing an outline truly a 45-minute ordeal? Keeping track of the difference in time that students budget for these tasks and the time they actually take leads to more accurate and useful plans. Take a glance at one student’s BVA for homework below and what do you notice? If you deduced that this student is a chronic underestimator, you're correct! She assumed she would be done with her homework 25 minutes sooner than she was… which was the exact length of the show she was planning to watch on Netflix after finishing her homework. She couldn’t watch the show because she had band practice, which led to considerable stress and frustration for the rest of the evening. The good news is that by writing out the BVA and reflecting on the outcome with her coach, she can learn how to stop a pattern of underestimating how long her work takes — which will lead her to greater efficiency next time (and fewer upsetting evenings in the future). As our students become adults, using BVA in everyday life will allow them to make realistic time estimates for other planning purposes. Knowing it actually takes 7 minutes, not the budgeted 2 minutes, to walk from the parking garage to their office will save them awkward conversations with a boss. Understanding that folding one load of laundry only actually takes ten minutes will help them fit that task in before going out to dinner, rather than having clean clothes sit in the basket all week. Learning time management tools like BVA as children and adolescents will help our students grow into punctual, organized adults. Just think what your child could accomplish, once those time management skills are mastered! Does your child use time inefficiently when tackling homework? Does "just a quick break" become a momentum-stopping break in productivity? Download our guide to planning effective homework breaks, to help students recharge and refocus - and finish their work on schedule. 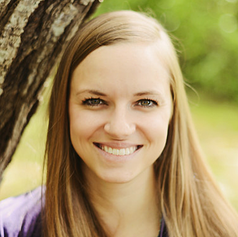 Maria Montague, M.S., CCC-SLP is a certified speech-language pathologist, reading specialist, and Executive Function coach with years of experience in public and private schools. Maria completed a master's program in both communication sciences and disorders and reading disabilities at MGH Institute of Health Professions and received an undergraduate degree from Northeastern University's School of Education. Maria's experience spans preschool to high school. Maria is a patient, understanding, and flexible coach with an arsenal of effective strategies and tools to help students better navigate their academic lives.